OMG! 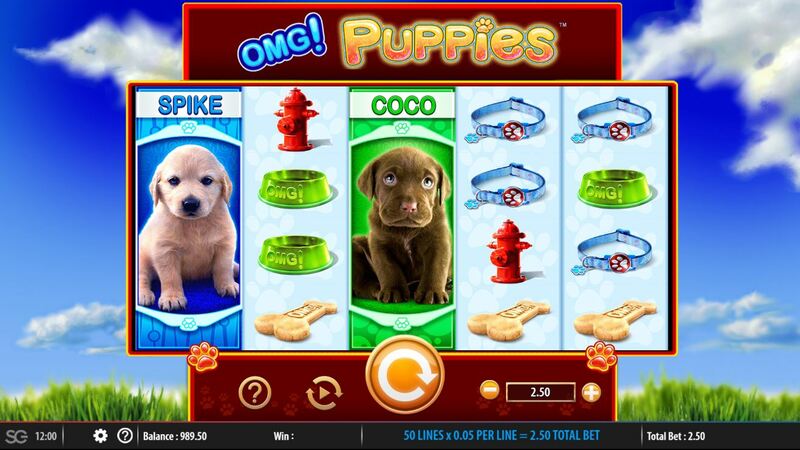 Puppies slot has such a distinctive prefix that not many players will have missed the fact that OMG! Kittens has already existed for a while now with its very distinctive reels and symbols. Now like me you may have intentionally avoided what is a very feminine and slightly childish looking game, only to be confronted by the canine equivalent a few years later. You may therefore be expecting a simple clone of OMG! Kittens but I'm pleased to say WMS have avoided that temptation and made it different - slightly. So will these adorable puppies be our friends for life or will they chew through our bankroll like an old pair of slippers? At first glance the reels of OMG! Puppies look the same as the kittens versions with their stacked symbols but we get 4 rows here over 5 reels and 50 pay lines unlike the 40 of the 3-row Kittens version. The icons are stacked 2-high with the exception of the puppies themselves which always appear fully in view so we have two distinctive groups of symbols. The low-paying ones are the Fire Hydrant (yes, very clever WMS!) at 2x bet for 5-of-a-kind, Food Dish 1.5x and Collar or Bone 1x. There are 4 stacked Puppies which are called Coco, Lady, Spike and Maxx. These will pay 1x for just two matching on the first 2 reels and will pay mixed for 3, 4 or 5-of-a-kind at 2, 5 and 10x bet respectively. Maxx is a stacked Wild also and only appears on the last 4 reels. Individually the Puppies pay 8x for Spike and 20x for Lady or Coco for a full line of 5. 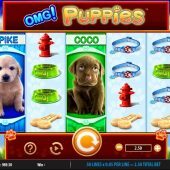 On reel 5 any of the puppies can randomly decide to award a multiplier which only applies if you get any 5-of-a-kind of similar or mixed Puppies. This can be 2, 3, 5, 10 or even 100x which means that a full screen of either the rather glum-looking Coco or Lady can pay up to 2000x bet! A decent change from the ultra-low potential of many recent WMS slots including the desperately poor Desert Cats. Lady will award 5 to 45 extra spins for 1 to 4 landing, Spike a 2x to 10x free spins multiplier for 1 to 4 landing and finally Coco awards 1 to 8x bet for 1 to 4 landing in the trigger. You can still get a 2 to 10x multiplier for the reel 5 Puppy though so it is possible still to get 100x overall with a 4-reel Spike trigger which applies an overall 10x multiplier.